We need quantity to get to quality. I’ve read a few more articles over the last few weeks where the focus was on quality at the expense of quantity. One of the posts was in the context of social media. It talked about how the way to build a social media following was to focus on quality posts and not just on creating a large number of posts. I totally get that. If you’re just posting random things to your social accounts all the time you’re probably not going to have much luck with engagement. Another post was about creating content for your website. It was about blog posts, ebooks, podcasts, videos, etc. All those kinds of things. Again, the article leaned on the point that quality is the focus. Quality is always the goal. I don’t think anyone jumps into something with the goal of not creating something that’s quality, but I think there’s a danger in getting into something with a strict goal on only creating things that are quality. When you start out doing something you don’t have much skill. Therefore, you need quantity in order to get to the level where you’re creating quality. I know that looking back on when I started blogging that I created posts that were pretty good. It was an okay start, but I know that today the posts I create are much better. I still create quite a few blog posts each year, but the quality is better. But I had to put in the effort and quantity in order to learn. It’s kind of like that with everything in life. I read another post from some time back earlier this year that really hit on the quantity point really well. 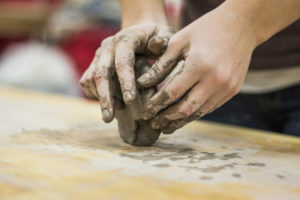 The post looked at some examples including one where an art teacher had one half of the students focus on creating one clay pot the entire year. They could work on this one pot and focus on creating the one best pot possible. The other half of the class worked on creating as many pots as possible. That’s it. No focus on quality. But at the end of the semester the kids that focused on quantity were creating better pots than the ones that focused on quality. That’s why quantity is needed, but obviously you can’t just do something over and over without a focus. There needs to be a focus on getting better, but it does seem that if you do something over and over that you’ll probably get pretty good at it even if that wasn’t your goal. I’m a big believer that we are what we do every day. If you want to be a writer you write every day. If you want to be a pro golfer then you golf every day. If you want to be an accountant than you work the books every day. By design or not be design we kind of become what we do every day. If you want to get good with something related to your business like sales or creating content or posting on social media then you need to do it every day. Some days the work will be good. Some days it won’t be good. But the key to success is committing to doing it all the time. Look at skipping a day as a big time sin. It just can’t be done. Some days it’ll be easy. You’ll be feeling good and you’ll be in the zone. Still do the same work on those days. Other days it’ll be really challenging. Maybe you won’t be feeling good or maybe something bad will have happened. Push through it and do what you can. Complete the daily task. By sticking with a schedule you’ll be putting in your quantity and that will build to quality. Many people can’t stick to a schedule and it’s why they struggle with some things. One final point on this debate is the idea of experimenting. The first step is to commit to doing what you want to do every day, on a regular schedule, but the next step is to make sure that experimenting is part of the equation. We’re coming into the NFL season. I’m a fan of the Green Bay Packers and this year the coach has been talking about getting back to basics with the offense, but he’s also talking about trying new things that he hasn’t done before. He’s doing much of what they’ve always done, but he’s adding in a little experimentation. I think that’s a good way to go about it. They practice the same things every day and that leads to the players getting better at the plays and at the fundamentals. They’re putting in their quantity to get to quality. But they’re also mixing in new things. They’re looking for new ways to get better. Maybe they discover a new fundamental or a new way to run a play that is better. If they discover something like that they then implement that into their quantity and they get better. In life we need a lot of quantity and repetition. We need regular schedules of doing the same thing over and over. And we need to mix that with a little experimentation. That will keep us engaged while we’re trudging through the quantity. And it will lead to jumps in innovation. Those two things combined lead to quality. Don’t fall into the trap of thinking that you need to create only quality things. That’s obviously the goal, but you need quantity in order to get to quality. Remember the experiment with the kids and the clay pots.